You can rest assured that the left will spin the crap out of this. But as the story points out, this is happening everyday. In cities along the southern border of the US. Not with a sad outcome like this, but there are thousands of deaths a year happening because of coyotes and traffickers that are willing to go to any length to make the money that feeds this disgustingly unlawful practice. It is an absolute travesty that this outcome occured, but it’s not the fault of those men and women enforcing OUR laws. It’s the fault of the law breakers. 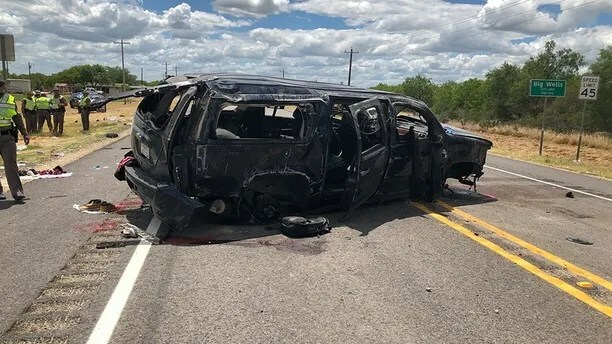 At least 12 people were ejected from a Chevy Suburban SUV carrying illegal immigrants after it crashed following a high-speed chase with U.S. Border Patrol vehicles near the Texas-Mexico border, a sheriff said Sunday, adding that five illegal immigrants were confirmed dead. Dimmit County Sheriff Marion Boyd said four people died at the scene off Highway 85 in Big Wells, Texas, at about noon, and one other person died at the hospital. A sixth person was said to be in “very” critical condition. Footage of the crash showed four bodies on the ground, the charred Chevrolet and several Border Patrol vehicles at the scene, Fox 29 reported. In all, 14 people were inside the SUV, including the driver and passenger, according to the sheriff. The driver, believed to be a United States citizen, was rushed to a hospital; the passenger, also believed to be a U.S. citizen, currently is in custody. The chase had reached speeds topping 100 mph, the sheriff added. A Border Patrol agent believed that three vehicles “traveling in tandem,” including the SUV that crashed, were smuggling illegal immigrants, Customs and Border Protection said in a statement Sunday night. Officials added that “multiple arrests” were made from each of the three vehicles. Boyd credited “good police work” for the reason why deputies started pursuing the vehicle, News 4 San Antonio reported, adding that Boyd said human smuggling was a “real problem” in the area. The sheriff said he hadn’t spoken to Border Patrol on the exact cause of the pursuit and nature of the crash. He added such chases, not the crash, happened almost every day. Boyd said the driver was known to police, and had been seen in the area “last week,” either scouting the area or looking for immigrants to smuggle. Fox News’ Kevin Kirby contributed to this report.